True luxury living is located on the second floor, in this two bedroom/two bath with double Bunk Alcove Aqua condominium. This condo is among the closest to the beach. No long elevator waits, as a convenient elevator only services 1st, 2nd and 3rd Floors. Private terrace, featuring 180 degree panoramic East and West beach views. Brand New Beds, Box Springs, Furniture and Decor August 2018! Beautiful new walnut color porcelain floor tile throughout this condo. Exquisite interior spaces include kitchen with granite counter tops, refrigerator with ice maker, microwave and laundry with washer and dryer. An elegant master suite features a separate glass-enclosed shower and vanity with double sinks. Living Room: Queen sofa sleeper, 40" Flat Screen TV, DVD, CD, Surround Sound. 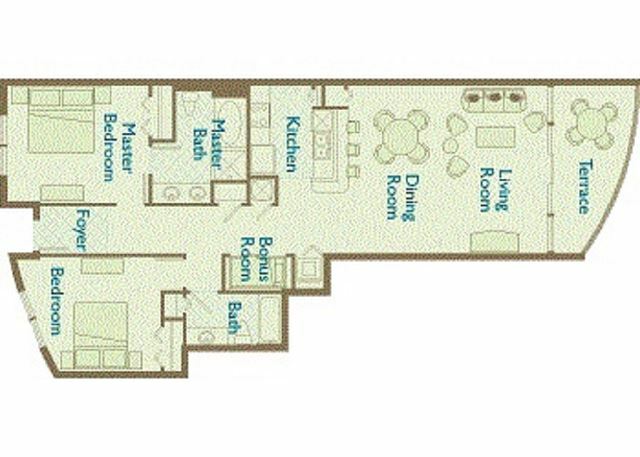 Unit 204 is in a great location, 2nd floor with am elevstor for floors 1-3 right down the hall. The property is well kept, the stadf is very friendly, and the heated pool was a favorite of our kids. It is walkable distance from Pier Park, so our teens were able to go hang out there when they wanted. I think the washer and dryer could be replaced. The dryer especially takes so long to dry anything and it makes a very loud grinding noise. We are very happy with Condo room 204. When we arrived the carpets had just been cleaned. We did have an issue with the Microwave. The handle came loose, but maintenance came up and fixed it and decided the whole Microwave needed to be replaced. We had a new microwave within 5 days. Overall we are very pleased with this unit and have booked it again for next year for 6 weeks. This was my 2 nd time visiting and ended up with the same room it was a pleasure. I love the new furniture!!!! Thanks to the owner for making my my stay a unforgettable moment. My family enjoyed staying here, everything was clean, and well kept. We loved Aqua condos so much we stayed a extra night. Very pleased with location, condition, and value for our family spring break trip! Overall our experience was good. Upon arrival, the unit could have been cleaner. Management did take care of our concerns.. The init does need painting, and carpets should be removed. The halls of the building need cleaning and painting, as well as the entry door to the unit.